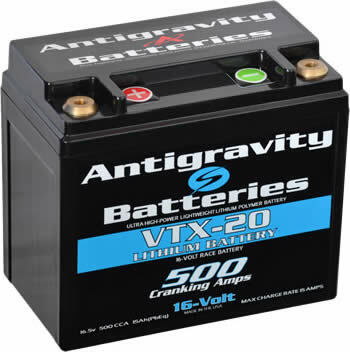 The Antigravity Batteries AG1601 is getting into the massive power arena with 480 Cranking Amps. It is the smallest 16-Cell lithium battery made. This battery can turn over many of the larger V-Twin motor up to 113 cubic inches. This battery is often chosen for Custom V-Twins where small size is needed. It is also a favorite in Race Cars.